Branch Out - Missions — Welcome Home to Zion! We are not a rocking-chair church. We are small, but we offer opportunities to get out of the pews after Sunday’s worship and get involved in missions – whether it’s joining a mission trip to Guatemala, feeding those in a northwest neighborhood in Rochester, collecting food for our neighbors in Wayne County, or making quilts to wrap around children after surgery in third world countries. And…we can do even more with more disciples who feel called to make a difference. We can also help build up your spiritual muscles through our meaningful worship time together, our women’s weekly Bible study and our adult Sunday School class. Check us out! We have plenty of room for you! Sharon Boyd (right), with a local worker, on a recent Volunteers in Mission trip to Alabama to repair homes destroyed by tornadoes. Zions Women's Ministry: Working in the Mission Field! The women of Zion have been meeting this year to address and support local, national, and global needs in the name of Jesus! Our Purpose Statement reads: Sharing the spirit of mission with those who are in need by using the gifts and talents God has given us to minister to others as Jesus did. Prayers, outreach and financial support have been extended to the Wayne County Rural Ministry/Come-Unity Center , American Bible Society, the Walworth Food Pantry, Wycliffe Bible Translators (to support our missionaries: The Satres, who are serving in Cameroon), Church World Service, and Cameron Community Center in Rochester. Income from our annual Turkey Dinner, summer rummage sale, and donations makes this possible! On-going needs of our local Walworth Food Pantry include: Cereal, Peanut Butter, Grape Jelly, and Tuna Fish. Please consider these specific needs when bringing forward food items the first Sunday of each month at Holy Communion. Our members have been in touch with staff in the Wayne, Gananda, and Pal-Mac school districts. Many student that are in need are brought to the attention of the school nurse. In the past we have provided support by donations of under cloths and finances. 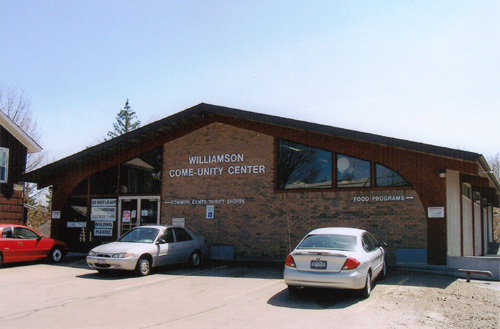 Our outreach includes supporting the Wayne County Rural Ministry/Come-Unity Center in Williamson with prayers, gifts, and finances. Zions Women's Ministries is also supporting our upcoming Guatemala Mission Trip with a gift of $500 AND the invitation to members of the congregation to contribute with individual donations. A basket on the side table will be set out for this purpose. Pastors Lida and Todd help a team build houses, distribute refurbished wheel chairs for individuals with developmental challenges, and distributes Zion's quilts to those in need. On the Road for Jesus! Members and friends of Zion have been taking part in national and international mission trips for years. Is God calling you? You could be on our next journey! 2012: Guatemala. Team: Pastor Lida and a team from Heritage Christian Services. 2013: Guatemala. Team: Pastor Lida and a team from Heritage Christian Services. 2014: Nicaragua. Team: Pastor Todd and a team organized by the East Rochester United Methodist Church. 2014: Guatemala. Team: Pastor Lida and a team from Heritage Christian Services. 2015: Guatemala. Team: Pastor Lida, Pastor Todd, and a team from Heritage Christian Services. 2016 Nicaragua, Team: Pastor Todd and a team organized by the East Rochester United Methodist Church. 2016: Guatemala. Team: Pastor Lida, Lynn Saxton, and a team from Heritage Christian Services. 2017: Guatemala. Team: Pastor Lida, Pastor Todd, Lynn & Linda Saxton, Terry from East Rochester United Methodist Church, and a team from Heritage Christian Services. 2018: Guatemala. Team: Pastor Lida, Pastor Todd and a team from Heritage Christian Services. Contact Pastors Todd or Lida about donating a gently used wheel chair or walker. We will have it re-manufactured, shipped, and provided to an individual in need in Guatemala. We bless each quilt before we send it to its new owner! We create quilts for Rotaplast International, an international program of international Rotary Clubs. The goal of Rotaplast International is to eliminate the incidence of untreated cleft lips and palates in children worldwide by the year 2025. Neighborhood and community volunteers join church members and friends once a month to create these beautiful quilts. Everyone is welcome! Quilting Ministry participants meet monthly, usually at our church building. Contact them for the next quilting bee! These sets were created in 2010; we have MANY more! Each year the members and friends of Zion take part in the national event known as the Souper Bowl of Caring, held on Super Bowl Sunday. We receive gifts of food and money above and beyond our regular monthly donations. We annually collect between 125 and 225 food items and send them with monetary donations and our blessings. Our Mission: Sharing Christ's love by offering quality gently used clothing at a low price. Opportunities exist to contribute clothing, donate money, volunteer, and serve on the committee. Zion has a long standing relationship with our missionary family, the Satres, serving as Biblical translators in the Central African nation of Cameroon. Vicky Satre is the daughter of one of our former pastors, the Rev. Dr. Victor Smith. Our support is through Wycliffe Bible Translators. Scott works on translating Biblical words and phrases into native African languages. Spectacular! They are working to spread the Good News of the Gospel of Jesus Christ on our behalf. Please consider supporting them directly with your thoughts, prayers, and gifts. Drop them a note of encouragement. We were privileged to welcome them home in 2005 and 2010 and look forward to receiving the Satres the next time they return.